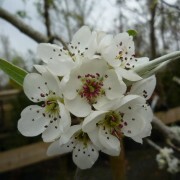 Pyrus salicifolia ‘Pendula’ is a large deciduous, weeping tree with narrow grey felted leaves. 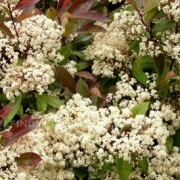 It has clusters of creamy white flowers in the spring, which are followed by green fruit. Salix alba ‘Britzensis’ is a beautiful medium, wide-spreading weeping tree. Lime green leaves. Red bark that stands out during the winter months. 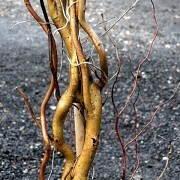 Salis ‘Erythroflexuosa’ is a small tree with vigorous orange-yellow shoots that twist and contort making a interesting shaped skeleton during the winter. Green foliage turning yellow in autumn. 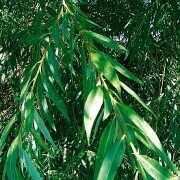 Salix purpurea ‘Pendula’ is a small tree with blue green narrow leaves and purple pendulous branches. Autumn leaves turn yellow. Takes pruning well, ideal for a wet area. Salix chrysocoma is a beautiful, spreading deciduous tree. 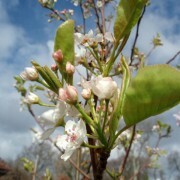 It has slender pendent, yellow-green stems and bright green leaves. The bark is golden yellow. Slender yellow catkins appear in the spring with the leaves. 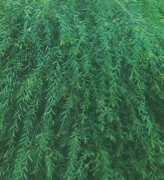 Sophora ‘Sun King’ is a small tree with elegant glossy green foliage. Large pendulous clusters of bright yellow flowers that are produced over the winter into early spring. Tilia cordata ‘Greenspire’ is a deciduous tree with an upright habit. Small heart-shaped dark glossy green leaves which are pale green below. Produces clusters of pale yellow flowers in mid summer. Tilia x euchlora is a medium-sized tree. It has glossy green leaves turning yellow in the autumn. It has creamy-yellow flowers which appear in July. It has an arching good shaped skeleton during the winter.